We are delighted to have been awarded 5 stars, the highest rating, by independent salon review site Salon Spy. 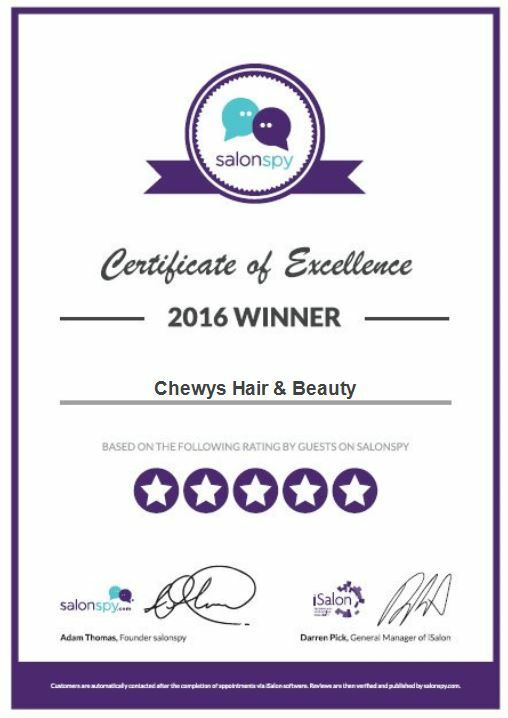 Salon Spy collects impartial, independent client reviews of hair and beauty salons across the UK and they have awarded Chewy’s Hair and Beauty a certificate of excellence for the feedback that you, our clients, gave during 2016. We’d like to say a huge thank you to everyone who has taken the time to share their Chewy’s Experience with Salon Spy. We’re overwhelmed with the wonderful things that you have to say about our salon, service and team. Here’s some snippets – to read all the reviews or leave one of your own, visit Salon Spy.